Dunlop Art Gallery, Mind the Gap! Dunlop Art Gallery is dedicated to engaging, researching and presenting a diverse range of visual artwork. Mind the Gap! is the title of the exhibition which gathered 30 artists from 14 cities and towns across Saskatchewan. It marked a celebration of the wealth of talent amongst the diverse population of emerging artists in the province. 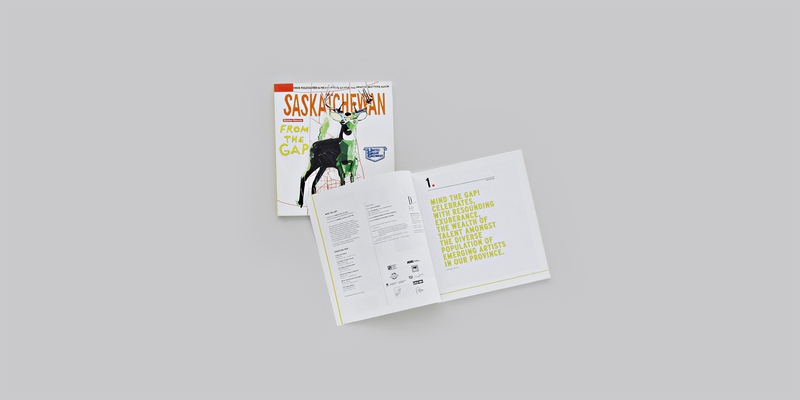 To document the exhibition and gain provincial and national exposure, a catalogue and website were developed drawing on iconic roadway graphics to build distinctive navigation and visual language throughout.